On a cold winter’s day James and his dad stepped off a plane in Tasmania. James was going to meet Alec Campbell, the last living Anzac. The year was 2001. James and his dad travel to meet Alec Campbell, the last living Anzac. James is bubbling with questions about all sorts of aspects of war. He wants to know whether Campbell was injured, whether he was scared, what he and the other soldiers ate. Interspersed with the questions from James, the story of Alec Campbell’s war service is explored. Illustrations swap between the present and 1915, with the latter images shown either full page or surrounded by a border, a bit like an old photo. The last ‘present’ image, with Alec Campbell and James together is also presented as a photo, perhaps suggesting the lasting memory of their meeting. The Last ANZAC is based on a true story of the meeting between James and Alec Campbell. It’s not easy to share the enormity of a war with young readers. Gordon Winch has put the reader in the story in the form of a character, James, who is about their age. This way James can ask the questions that a young reader might ask. Illustrations also present more information sure to generate more questions and opportunities for discussion either at home or in the classroom. 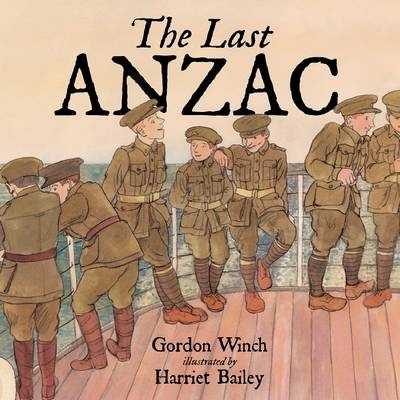 ‘The Last ANZAC’ offers an introduction to WWI for early primary readers, showing them Gallipoli through the eyes of someone who was there. Endpapers include copies of wartime letters, postcards and envelopes. as Wilhelmina disappeared down the track. Enoch the Emu is good at kicking, eating, strutting and hanging out with his mates at the Emu Club, but he is not good at doing his bit around the nest. When his wife Wilhelmina gets sick of looking after the eggs she has laid, she decides to leave. Now Enoch must look after the eggs. At first he thinks it will be easy, but as the weeks drag by he realises just how hard it is. Still, when the eggs hatch he is as proud as can be – and can’t wait to show off his chicks to his mates at the club. A timeless treasure, it is wonderful to see Enoch the Emu back in print. Apollo has a moment of introspection and decides that it’s time to change his life. No more will he eat, eat, eat. No more will he frighten all the other forest occupants. And perhaps then he won’t be so lonely. So, day by day, he alters his diet and, he hopes, his life and position in the forest. But no matter how he tries, instead of improving his lot, his efforts seem to make him feel worse and worse. Finally he seeks counsel from a wise old owl. Only then does his role and his life make sense. Illustrations are full page and include many other forest dwellers. An information page at the end of the story provides more details about this threatened species. Apollo wants to be more like the other animals in the forest and perhaps then they will be his friends. But it’s not as easy as that and Apollo discovers that he has a role to play in the ecosystem and that there are other ways and other places to seek friendship. It is a story about being yourself as well as discovering that everyone has a role to play in the world. There is opportunity to use this story in a classroom to introduce an Australian animal, an Australian environment, discuss food chains and ecosystems. Readers will empathise with Apollo and his need for companionship and will celebrate with him at the story’s conclusion/solution. Recommended for pre- and early-readers. who wanted to be different. Samantha wants to be different and although she is advised that in time she would be different, she just can’t wait. She decides that shoes will be what makes her different. So she tries high heels, gumboots and more, but each has limitations for a seagoing gull. When her shoes fail, her fiend Simon is there to tell her that she is beautiful just as she is. Not that Samantha believes it. And with each failure she has to endure ridicule from the other gulls (except Simon). The ridicule causes her to blush, red feet, red eyes and beak. Finally, she thinks she has found the perfect shoes to make her different. Illustrations are pencil and watercolour and realistic in style, although the hermit crab has a few extra features! His eyebrows are fabulous. Many children are in a hurry to grow up, to find their way, their own special place. And because they are impatient, they can’t hear the advice they’re given, nor can they see some of the consequences of their actions. Samantha is keen to be different, but doesn’t realise – or perhaps doesn’t value – the unconditional friendship offered by Simon. Simon on the other hand is patient, uncritical and supportive. The crowd? Well they’re a crowd and act as one with no heed for the impact. This is a 25th birthday for Samantha Seagull’s Sandals , a tremendous achievement for a picture story book. In a post script, there is information about silver gulls. It’s true, their legs, eyes, beaks do really change colour as they become adults. Recommended for early primary readers. This book can be purchased in good bookstores, or online fromFishpond. Matilda is very special. Whenever she eats one of the delicacies her grandfather brings back from his trips overseas, she develops a new special ability. When he brings back bright blue jelly babies from the Bahamas, Matilda discovers that eating one turns her invisible for three hours. She decides to use the new power to get up to all sorts of mischief – from tricking people in the supermarket, to tickling the school principal during a long, boring speech. But her grandfather wants her to also use her special powers to help people and, when she and her mother are caught up in a bank robbery, she sees her opportunity. The Invisible Matilda Mudpuddle and Matilda Mudpuddle and the X-ray Eyes are two new titles in the Matilda Mudpuddle series. Each book features Matilda having adventures with a new special ability, each of which is limited in time – the invisibility only lasts till she’s eaten the last jelly baby, whilst her x-ray vision lasts for a month. Each chapter features a new adventure with the relevant ability, so that each can be read as a self-contained adventure, making them accessible to slow readers. This is a fun series which will appeal to kids aged 7 to 9.